In Storyboard Pro, you can export your project’s audio into Waveform Audio Files (.wav). You can choose to export a single file for all your project's audio tracks, or to export each audio track individually. You can also choose to export a single track for your whole project, or to separate it by scene, sequence or act. Select File > Export > Audio. The Export Audio dialog opens. Process Audio Tracks Individually: Exports each audio track in your project into separate sound files. Merge All Audio Tracks: Mixes down all the audio tracks in your project into a single soundtrack before exporting it. Process Audio Tracks Individually and Merged: Exports each audio track into separate sound files, then exports another file with all the audio tracks mixed together. Don't Break Sound: Exports audio tracks spanning for the entire length of your project. If you chose to merge audio tracks, you will have one sound file for the entire project. If you chose to export audio tracks separately, you will have one sound file for each audio track in your project. Break Sound Per Scene: Breaks down each exported audio track into scenes. If you chose to merge the audio tracks, you will have one sound file for each scene in your project. If you chose to export audio tracks separately, you will have one sound file per scene per audio track. Break Sound Per Sequence: Breaks down each exported audio track into sequences. If you chose to merge the audio tracks, you will have one sound file for each sequence in your project. If you chose to export audio tracks separately, you will have one sound file per sequence per audio track. This option is only available if your project contains sequences. Break Sound Per Act: Breaks down each exported audio track into acts. If you chose to merge the audio tracks, you will have one sound file for each act in your project. If you chose to export audio tracks separately, you will have one sound file per actper audio track. This option is only available if your project contains acts. Sample Rate: Sets the frequency rate of the exported audio files. It is recommended to export sound files at the rate at which they were originally created. For reference, the standard sample rate is 48.0 kHz for broadcasting and DVD. Bit Depth: Sets the precision level of each wavelength in the sound file. The standard bit depth is 16 bit. Setting this to 8 bit will cut the size of audio files in half, but will significantly impact sound quality. 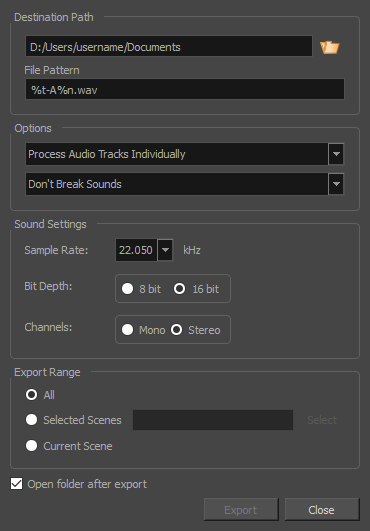 Channels: Allows you to select whether to export sound in Mono or Stereo. Stereo sound uses a separate track for the left and right speakers, which allows to simulate a realistic sound environment. Mono uses a single track for both speakers, which saves disk space. Select the Open folder after export option to have the system automatically open the folder containing your exported audio files.